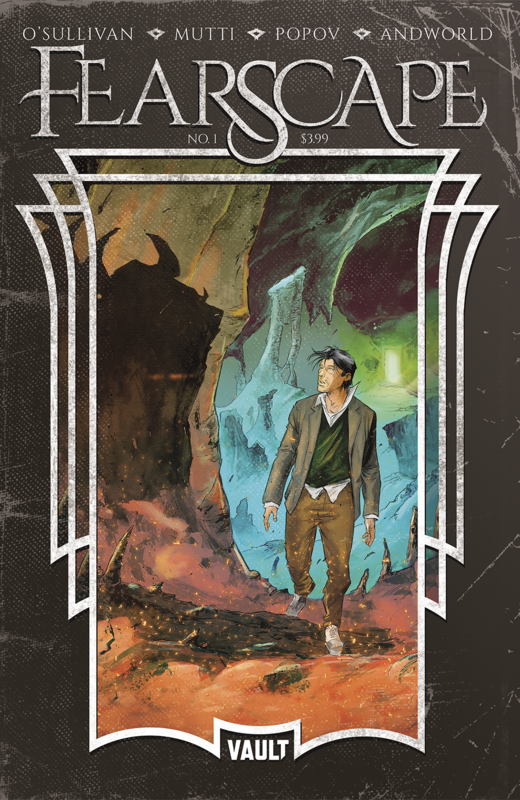 I am extremely excited to review Fearscape #1 for two reasons: first, I thought the cover and solicit information was spot on, leading to me placing an order for it. Second, this will be the first single issue I have reviewed for a Vault Comics title, having reviewed a trade paperback in the past (Failsafe). As soon as I got this book, I had to make time and dive in. What I found was something that feels like it would be related to the awe-inspiring Sandman books. Yes, this debut issue is that good. From writer Ryan O’ Sullivan and artist Andrea Mutti, colors by Vlad Popov, and letters by Derron Bennet, Fearscape is a beautiful, literary journey from our world to one full of wonder and creativity. One per generation, a muse comes out to Earth and finds our greatest storyteller to take back to the Fearscape to battle the embodiment of all fears, and literary creativity is how to combat these fears. But instead of finding Arthur Proctor, one of the greatest fantasy genre authors there is, she finds his friend and novel translator, Henry Henry. An aspiring writer with a tendency to plagiarize, Henry shows his lack of character when he allows the Muse to mistake him for Proctor and gets whisked away to a new world. The design elements here are spot on, as the book is being narrated from the point of view of Henry. So there are lots of mentions to literary devices, both in novels and in sequential art, enough to show that this charlatan is trying to make himself sound more legitimate than he is. We not only follow Henry’s journey but that of Jill, daughter to Arthur Proctor, who has been losing a fight with his mental well-being. O’Sullivan has created quite the story here, one that leans heavily on the literary aspects of comics but does so by linking it to the importance of the plot. Mutti’s artwork looks fantastic, vibrant, and harrowing when we enter the Fearscape. By the end of this first book, Henry is just starting a journey he has no business in. But I implore you, dear readers, to pick up this starting point to a fresh, new idea in the world of sequential art. Fearscape shows us how storytellers can save the world, one story at a time, but can a con man like Henry? I can’t wait to see how his journey goes and ultimately ends.